Since the beginning of the school year at KIST, I have used OneNote Class Notebook, an ‘add-in’ for MS Office, to document and organize evidence of learning in the classroom. The experience started with creating the layout of the shared and student sections. Having never used the tool before, I did my best to predict what design would serve our needs. Months later, in reflection, I can see that my choices were acceptable but nowhere near ideal. Anyone else planning to use Class Notebook should be advised to consider the sections they will use carefully, especially according to class routines and assessment practices. Although I was dismayed to receive an error message initially, the class creation tool worked perfectly and it is easy to add new students later. It creates a class notebook which includes a ‘Content library’, which the teacher can edit and students can view, ‘Collaboration space’, which everyone can edit, and individual sections for each students. All of the sections have customizable features, so a thoughtful and well designed structure goes a long way toward capability and usability. A smart device is essential to making best use of OneNote. Being able to shoot photographs of students and their work directly into their notebooks is an invaluable time saver. 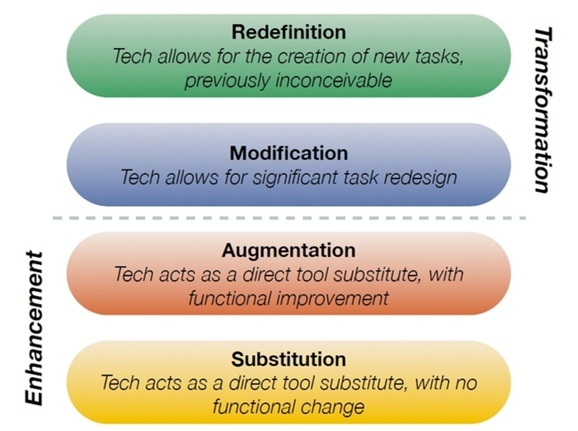 On the SAMR scale, I would rank it a strong ‘A’ for augmentation. However, if every student had a smart device, if only for the purpose of maintaining a digital portfolio, OneNote would enable significant modification of the processes of documentation and student ownership of learning. Taken further, the empowerment of having equitable access to teacher and student created learning materials could be truly transformational. As we use it now, I am able to upload in real time via my smartphone and students access their notebooks in PC Lab or when possible in class. I am very excited to take the lessons I’ve learned in the past months to design a rich digital learning environment next year using OneNote Class Notebook.